Kelly & Austin: Harry! Potter! Feast! Last night was hands down one of our best Aus-town outtings and date nights ever at the Alamo Drafthouse. We purchased our movie feast tickets early so we were both quite excited for the event and headed out early, knowing we could enjoy a beverage and appetizer if we wanted. I thought about bringing a camera, decided against it, then decided to bring our little one only to forget it at the last minute. It's too bad because we arrived to find all the servers in costume, ours being Bellatrix. This was an adults only event so there weren't any little Harry Potters in the audience though there were some cool t-shirts. While we settled in, we had a drink and shared some chips and salsa (we were both starving since we tried not to overeat at lunch). They were screening old 1950's-1980's campy ads, clips about magic, and sci fi tidbits. We enjoyed taking that, in nibbling, and trying to identify all the characters among the staff. Harry, Hermione, Snape, and Draco Malfoy were definitely present among others. Before the movie started, the chef was introduced and shared the inspiration for his British feast. He also made reference to his previous work on the Kevin Bacon Bacon Feast which caused Austin to perk right up in curiosity. Anyway, he introduced the menu and we gave him a round of applause. The lights went down and instantly, the staff were quickly and quietly moving to get the first course going, capes flying. We were served Speckled Hen ale with the first course, a chilled leek soup topped with crab. Austin and I both deemed this to be the best course; the soup was chilled but salty and the crab was perfectly sweet. It was so refreshing yet tasting and filling. I had some of the ale and passed the rest on to Austin. Second, we were served one seared sea scallop on pureed peas with bacon and honey cider vinaigrette. I thoroughly enjoyed the combination but the scallop alone wasn't that enjoyable. Scallops are usually very hit or miss with me. This was paired with Black Thorn Cider which was delicious so Austin didn't get any of mine that round. Our third course, the main dish, was beer braised roast beef with Twice Baked Potatoes stuffed with Stilton and bacon. I tried a bit of beef and reaffirmed that I just don't care for red meat. The potato, however, was awesome! The pungent Stilton and salty bacon were perfect; Austin couldn't say enough about it on the way home. This was paired with Hob Goblin ale, not bad in my opinion but I couldn't finish it so once again, the rest went to Austin. I was the designated driver for a reason. 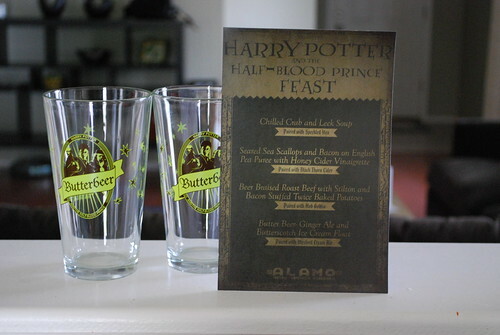 Our last course was dessert, named for the butter beer featured in the books. We had a float of butterscotch ice cream, studded with butterscotch candy pieces, and ginger ale. It came in the pint glasses featured above that we got to keep along with a glass of Wexford Cream Ale. Overall, the meal was fantastic. They did a nice job infusing each plate with intense flavor rather than trying to make up for it in quantity (good for those consuming all the accompanying beverages!). We left completely sated, discussing each course and what we liked best or would have changed. The courses came out every half hour with great efficiency and minimal distraction to movie watching. The servers reminded me of theater crews that wear all black and silently make adjustments to the set between acts. Still, it was fun to see who served us each course (sometimes Snape!) and see the capes billowing around. The service was definitely on par with the food. Oh, and the movie, of course! We both enjoyed The Half Blood-Prince though it did get a little long. I was particularly struck with how the Hogwarts faculty, perhaps intended to be caricatures, really resembled some U.S. professors. Ever the student, I thought maybe I was seeing what I wanted to see but Austin agreed with my take on it. The cinematography was well done in a darkly whimsical way and the main characters delivered. It's not on my favorite movies list but it was enjoyable and the entire experience was incredible; we're definitely looking forward to going to the next feast.